YARN, the Hadoop operating system, enables you to manage resources and schedule jobs in Hadoop. YARN allows you to use various data processing engines for batch, interactive, and real-time stream processing of data stored in HDFS (Hadoop Distributed File System). 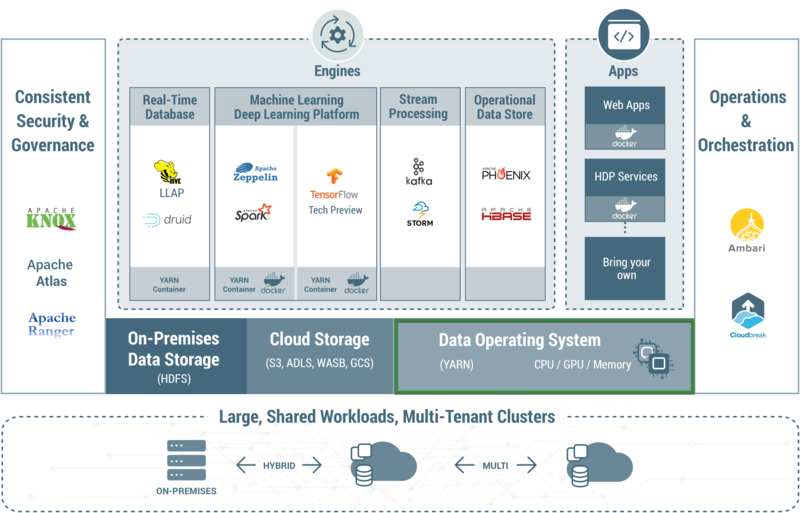 You can use different processing frameworks for different use-cases, for example, you can run Hive for SQL applications, Spark for in-memory applications, and Storm for streaming applications, all on the same Hadoop cluster. YARN extends the power of Hadoop to new technologies found within the data center so that you can take advantage of cost-effective linear-scale storage and processing. It provides independent software vendors and developers a consistent framework for writing data access applications that run in Hadoop. Support for Docker containerization makes it easier for you to package and distribute applications, it allows you to focus on running and fine-tuning your applications, therefore reducing "time-to-deployment" and "time-to-insight". ResourceManager: Allocates cluster resources using a Scheduler and ApplicationManager. ApplicationMaster: Manages the life-cycle of a job by directing the NodeManager to create or destroy a container for a job. There is only one ApplicationMaster for a job. 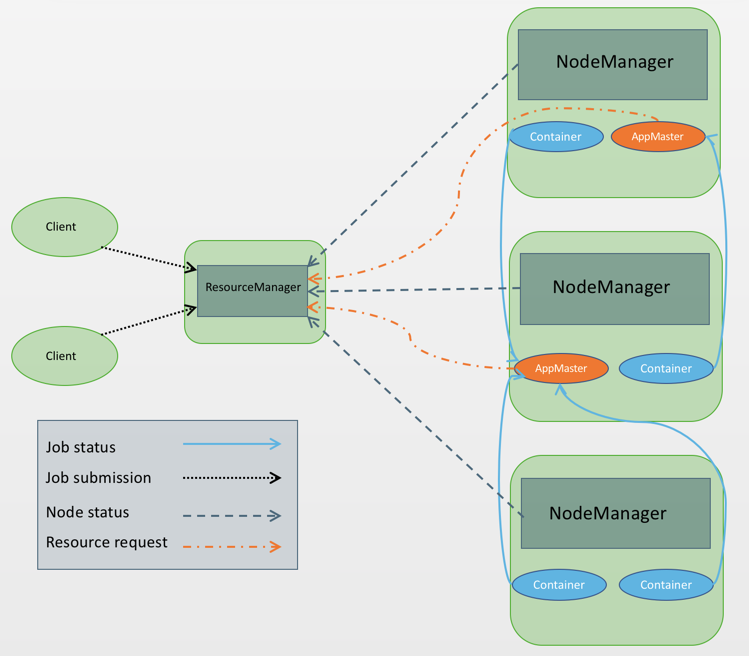 NodeManager: Manages jobs or workflow in a specific node by creating and destroying containers in a cluster node. You can use multiple open-source and proprietary data access engines for batch, interactive, and real-time access to the same dataset. Multi-tenant data processing improves an enterprise’s return on its Hadoop investments. You can use docker containerization to run multiple versions of the same applications side-by-side. You can dynamically allocate cluster resources to improve resource utilization. You can use multiple resource types such as CPU, GPU and memory. Significantly improved data center processing power. YARN’s ResourceManager focuses exclusively on scheduling and keeps pace as clusters expand to thousands of nodes managing petabytes of data. MapReduce applications developed for Hadoop 1 runs on YARN without any disruption to existing processes. YARN maintains API compatability with the previous stable release of Hadoop.